KOKOMO, Ind. – In Indiana, basketball in March is king. 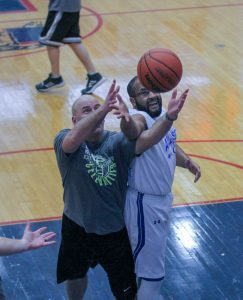 And for the 18th year, Bona Vista Programs hosted its own version of Hoosier Hysteria with its annual Disability Awareness Basketball Game. With hundreds of fans cheering in Memorial Gymnasium, for at least the 10th consecutive year, the Bona Vista All-Stars defeated the Expression’s Celebrities 64-49. The Celebrities got off to its usual hot start as they led 16-14 after one quarter. Ryan Smalley dropped in a pair of 3-pointers while Brad Conwell and Joe Thatcher each canned a triple for the Celebrities. On the other end of the court, Antonio Reyes scored five and Craig Simmons three to keep Bona Vista in the game. The second stanza was a little different as Bona Vista outscored the Celebrities 21-6 to take a 35-22 lead into the break. Elizabeth Bowers had five points to lead the charge as six different BV All-Stars scored. The All-Stars put the game away in the fourth as Steve Martin dropped in six points and Reyes added five. For the second straight year, Bowers led the Bona Vista All-Stars in a balanced scoring attack, dropping in 11 after scoring 22 a year ago. Andrew McKinney and Reyes had 10 each, Martin added eight, Simmons seven, Robert Weaver seven, Brittiani Gillem four, Charles McKinney four and Robert Miller three. Other members of the winning team included Terry Fields, Dee Taylor, Dorman Miller, Brooke Sawyer and Eli Alexander. For the Celebrities, Brad Conwell led the way with 10 points. Smalley had eight, Jimbo Rayl seven (he played in the shoes he wore while filming Hoosiers), Thatcher six, Mark Jansen five, Jessica Green four, George Myers three, Brian Pier two, Shelly Wyman two and Joni Delon two. Others members of the squad included Troy Stiner and Doc Hicks. The evening also included a declaration read by Kokomo Mayor Greg Goodnight and performances from Kokomo High School’s Advanced Chamber Ensemble, KHS Dance Team, Dance Elite, KHS cheerleaders and the Kokomo Flipsters. The volunteer basketball officials were Tim Knowland, Greg Cunningham and Kyle Smith. The event’s major sponsors included Expressions Design, City of Kokomo, Rock 98.5, WIOU and Z92.5.